Reducing the application of road salt is key to reducing chloride levels in Lake Wingra, which was identified as one of the three goals of the Lake Wingra Watershed Management Plan. The average chloride concentration in Lake Wingra was 115 mg/L (2012 data), the goal for the lake is 40 mg/L. We recently received a grant from Madison Metropolitan Sewerage District and City of Madison Engineering to work together with road salt applicators who are trying to reduce their salt usage this winter. We hope that by working together with the applicators we can take steps to reduce the amount of salt being applied while still maintaining safety. Studies have shown that many applicators apply 3 to 5 times the amount needed to be effective so training the applicators in reduction techniques should help us to reach our goal. 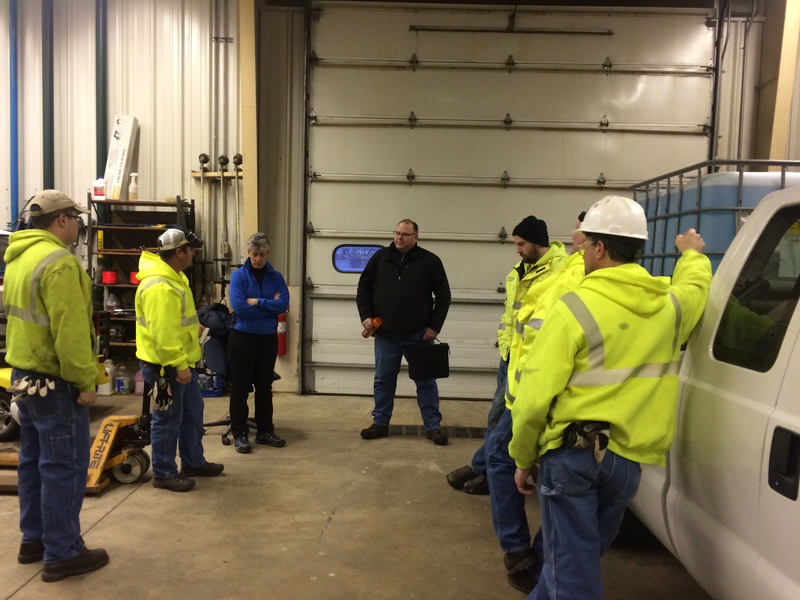 Last week, we hosted a hands on training by Fortin Consulting, Inc., which is a company from Minnesota that has been working on the road salt reduction issue for more than 10 years. 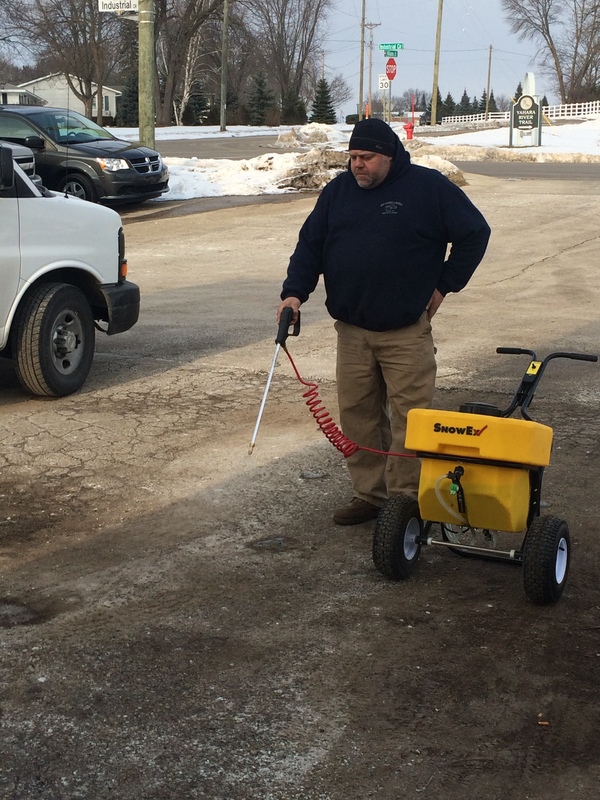 They offer training for road salt applicators and have previously held training in Wisconsin. Our board member, Roger Bannerman, wanted to give applicators the opportunity to have a hands-on session with the trainers to learn how to calibrate their own equipment, ask questions specific to their operations and get advice in a field setting rather than the typical class room training setting. We were fortunate to have Connie Fortin (owner of Fortin Consulting) and Craig Eldred come and be our trainers for the day. Craig is the Public Services Director for the City of Waconia, MN and has real world experience with the techniques, this proved to be invaluable for our training. He has utilized road salt reduction techniques since 2000 and also shared that 80-90% of the municipalities in Minnesota are taking steps to reduce their road salt usage. We were able to travel around Dane County and work with four different organizations who are actively trying to reduce their road salt usage. Our first stop was at Madison Metropolitan Sewerage District, their maintenance team is responsible for the winter maintenance of all the parking lots, sidewalks and interior roads at the sewerage district. This team had a high level of knowledge about the hazards of over application of road salt and showed a commitment to reducing their usage. They also exhibited a lot of ingenuity in coming up with ways to work with equipment and materials they have available to build equipment for their specific needs. 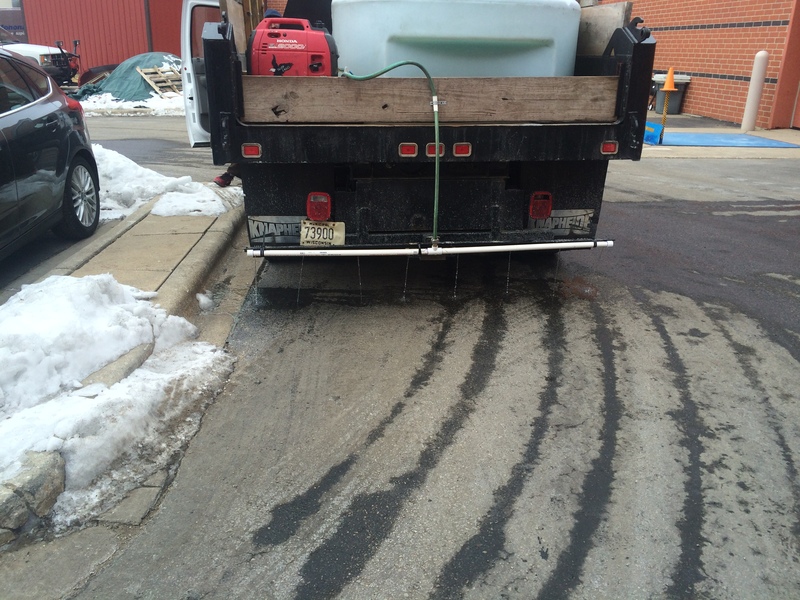 They have purchased a truck mounted brine application system (shown in the above picture) and begun treating their areas with brine rather than rock salt. The brine they use is 23% NaCl, which is applied prior to winter weather events or to prevent frosty roads in areas that have a lot of moisture, which is an issue they deal with at the district. The salt brine is effective to 15-17 degrees and works by preventing snow or ice from bonding to the pavement surface which makes it easier to be removed with a plow. Craig stated that by switching to primarily using brine the City of Waconia has been able to reduce their salt usage by 50% or more! The second stop was at Monona Grove School District, they are just getting started with learning about road salt reduction techniques and we had a great opportunity to talk about how road salt affects area lakes, groundwater and more. 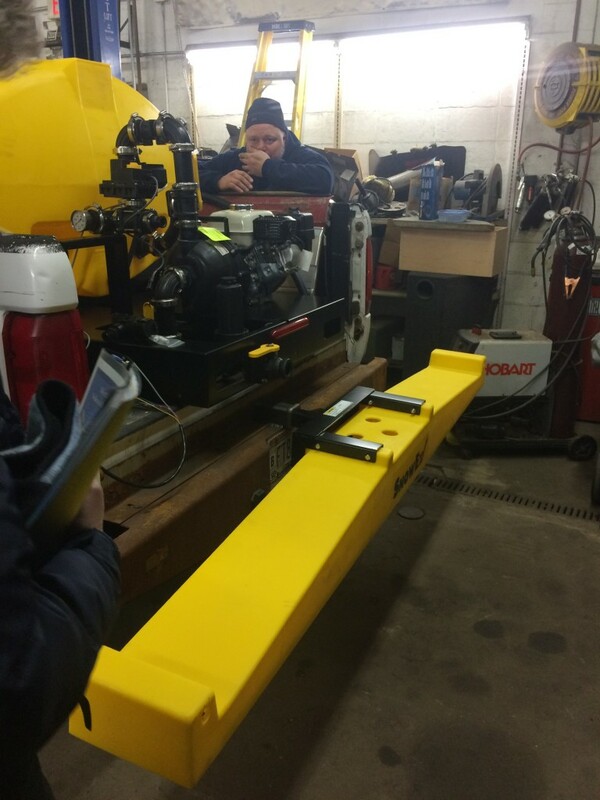 The maintenance team consisted of about 8 people, and using their creativity and knowledge they have been able to put together some brine application equipment very inexpensively with parts and equipment they already had at their facilities. 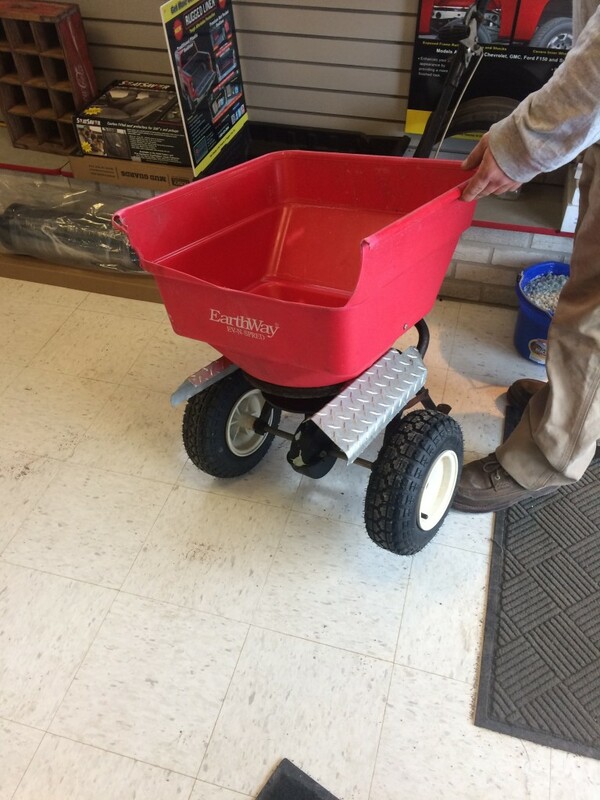 They also have a truck mounted system (shown above) and also an applicator (shown below) that they pull behind a four wheeler to apply liquid to their sidewalks and trails. By talking to Craig and Connie they were able to learn how to calibrate their equipment so that they could track how much salt they were applying and learn from experience what works for their facility. Additionally, by tracking their reduction in road salt application they will be able to determine how much money they will be saving on road salt and potentially use those savings to fund equipment upgrades in the future. Our third stop was at the Village of Shorewood Hills. This team primarily works on clearing the streets in the Village so has different needs and experiences than our previous two groups. Additionally, due to the hilly nature of the community they apply salt to almost every road in the village. They also had some good questions about how green infrastructure and road salt interacts. Many people may believe that rain gardens are effective at capturing road salt and keeping it out of our waters. Unfortunately that is not true, road salt that goes in to a rain garden infiltrates through the rain garden and ends up in the ground water rather than directly into the lake. This infiltration can contaminate our drinking water or reach the lake by coming up through natural springs that feed the lakes. Additionally, the road salt may kill the plants in the rain garden. After 2 workers attended a previous training session they were able to calibrate their trucks and learn that one of their trucks was not working properly and was applying more than 3 times the amount of salt it should have been. They are working on fixing this truck and not using it currently. They have used brine in the past but had some issues with it so had stopped using it. Craig was able to offer them some ideas, such as changing the edge of their plow blade that might make their streets clear off easier after brine application, additionally, the roads in the Village have been resurfaced recently so that may make the system work better. Our final stop was in Stoughton, at Mad Plowing and Mowing, LLC. This company works as a private applicator, clearing parking lots and sidewalks of various sizes of businesses around Dane County. They have purchased a brine application system for one of their trucks that is equipped with ground speed controls (shown above). Friends of Lake Wingra is going to be working with them throughout the remainder of the winter to monitor how well the equipment works in three different parking lots on the west side of Madison. This information will then be used to demonstrate to other private applicators as well as the general public that a lower level of road salt may be applied and still maintain safety. Look for more information about this project in future blog updates. 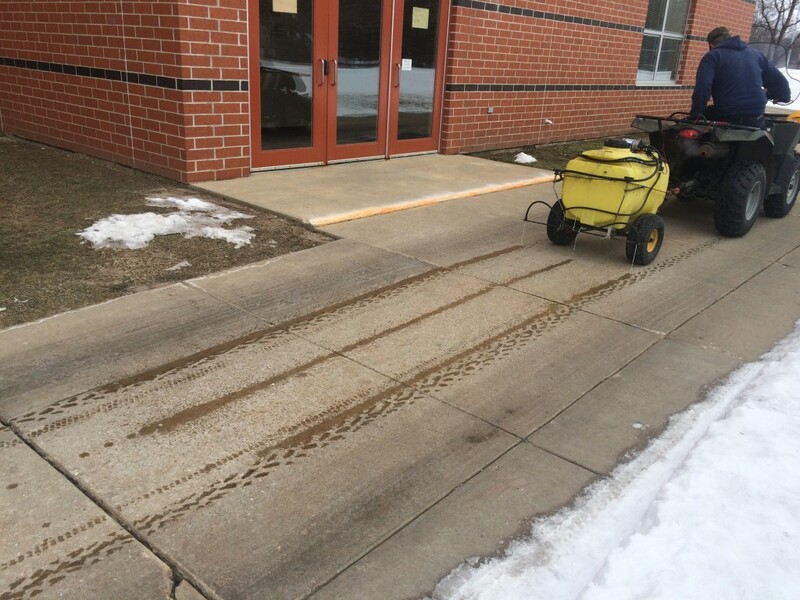 Mad Plowing also purchased a brine application system for sidewalks and stairways (see below). They had previously equipped their sidewalk spreader with shields that keeps the road salt from flying off the sidewalk and into the lawn. At the end of the winter we will be checking back with all of these organizations to see how their new equipment worked out and to see how they were able to put the ideas they learned in our hands on training session in to practice. 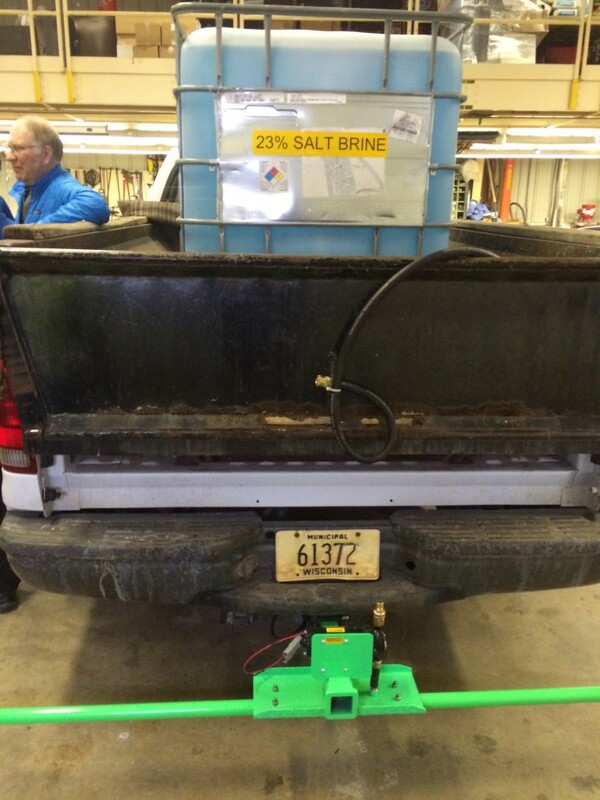 We hope to be able to report how much each group was able to reduce their road salt usage this winter!